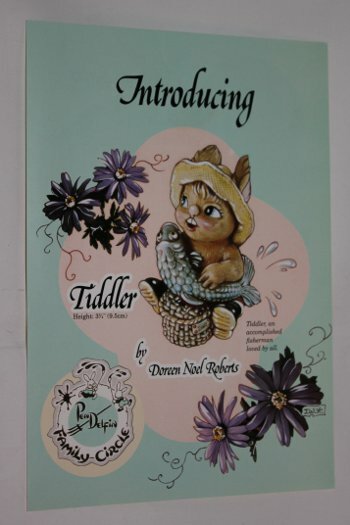 A PenDelfin leaflet introducing the PenDelfin rabbit Tiddler that was designed by Doreen Noel Roberts. The PenDelfin Tiddler rabbit was first introduced by PenDelfin in c1996 and was retired from production in c2002. He is sitting down with his basket and rather large fish! This is a double-sided PenDelfin leaflet with Tiddler with his fish pictured on the front and the PenDelfin Christmas Series on the reverse - the PenDelfin Christmas Cabin, the PenDelfin Christmas Island with PenDelfin Bobby alongside all ready for the snow on his sledge!